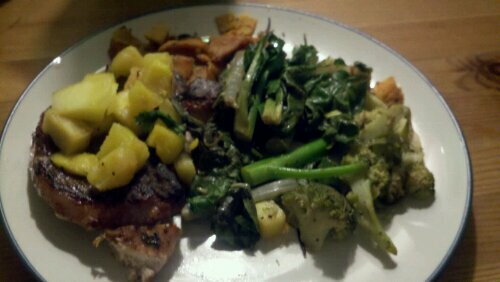 I like to marinade my veggies in balsamic, salt, and pepper. 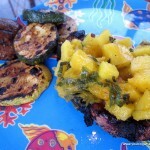 I’ve been experimenting with fruit on the grill, so I sliced a pineapple and threw it in the marinade. 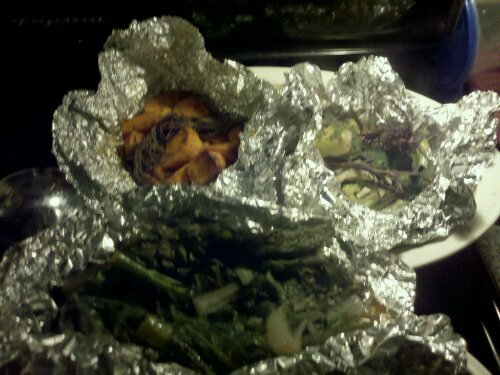 Aluminum foil worked well for combining pineapple chunks and mango slices with fresh cilantro in a grill packet. This made a great chutney for the chops! YAY SUMMER! The whole process is simple. 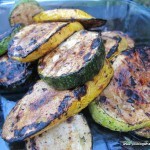 Preheat your grill. 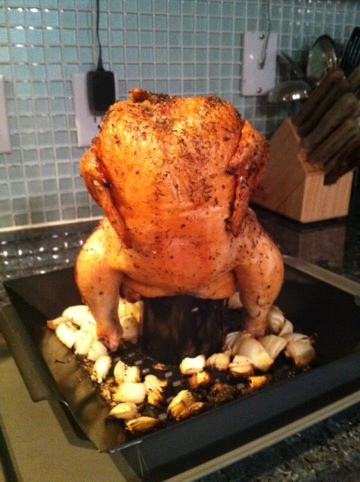 Get a chicken, a can of the beer of your choice, herbs, aromatics, lemon, whatever. Open beer can and put it in the center cylinder. You can add seasonings to the beer if you like. Add the cone piece over the cylinder/beer. Season the outside of the chicken, and put the chicken’s cavity on the cone so it’s upright. Then arrange the vegetables, herbs, etc. on the tray around the chicken. 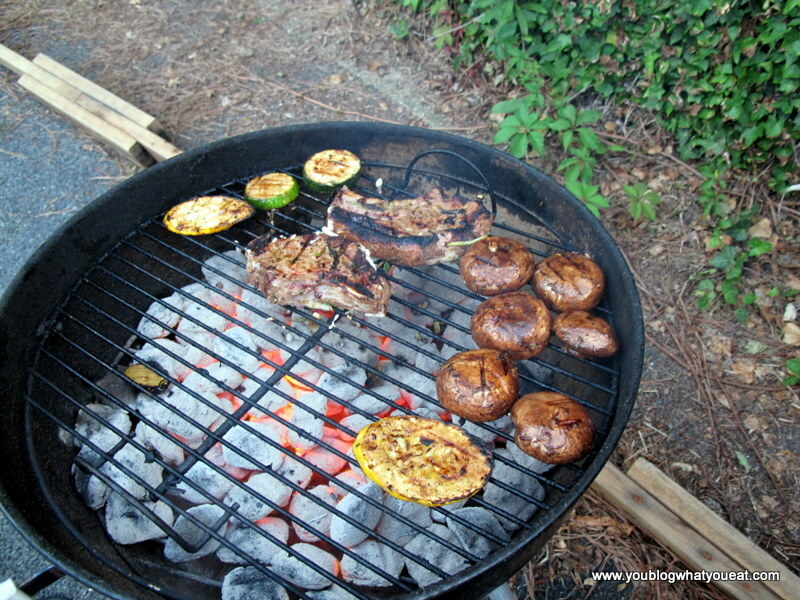 Grill on indirect heat at 400-450 degrees for about an hour – check the temperature of the meat. Enjoy some of the moistest chicken ever! I’ve had a well-marbled, naturally-raised strip steak almost two inches thick sitting in my fridge for close to a week. Finally, the weather has decided to cooperate on an evening when I don’t have a prior commitment, so I was able to fire up the coals and “get my grill on” for the first time this year. I prepped the steak by trimming the excess fat and rubbing it with olive oil, salt, fresh ground pepper, and a secret blend of over 40 powdered hot peppers. Tastes in steak vary, and I usually go for medium-rare, but I opted for “extremely rare” because I could barely wait to taste it. Plus, I was indulging the apex-predator/grilling-carnivore aspect of my nature, so it seemed appropriate that the meat be more than a little on the red side. 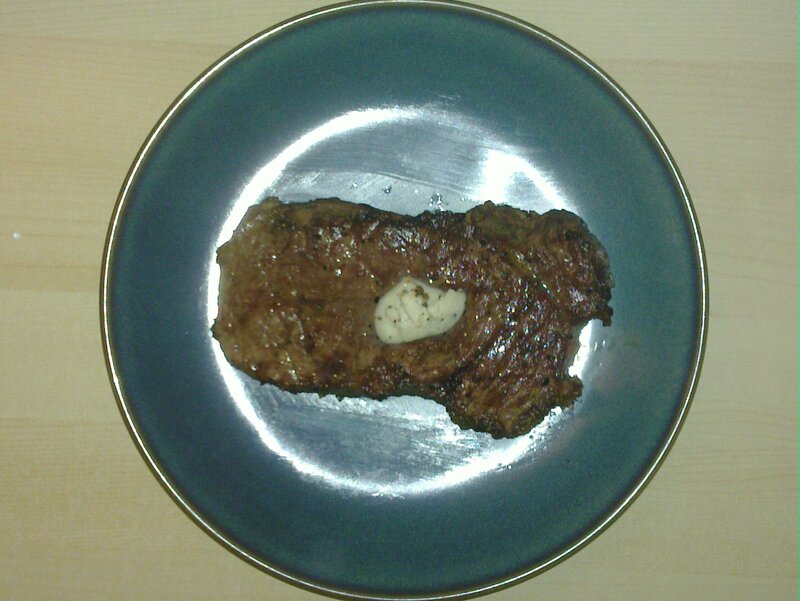 To add a little extra dash of savory goodness to the final presentation, I topped the finished steak with a dollop of black truffle butter. A steak this good deserves to stand proudly and confidently alone on the plate, as if defiantly declaring, “I don’t need any help to be delicious!” Let it rest there for a few minutes to admire it, and to let the temperature even out. I recommend enjoying it on its own and then squaring out the meal with sides only after the steak has received the respect it deserves. 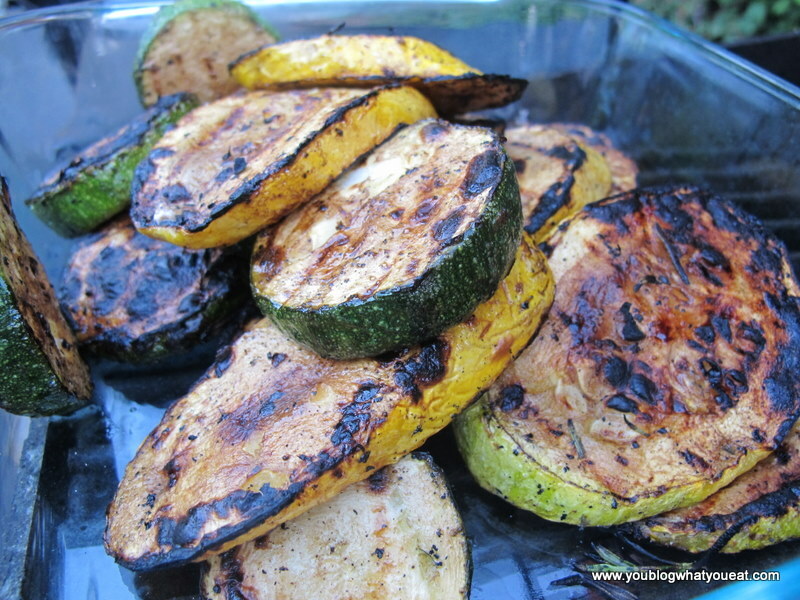 A great side to consider as we enter the warm months is some zucchini or summer squash split lengthwise, drizzled with olive oil and pepper, then grilled alongside the steak. I, however, just washed mine back with some beer. Heavy Seas Märzen, in case you’re curious. 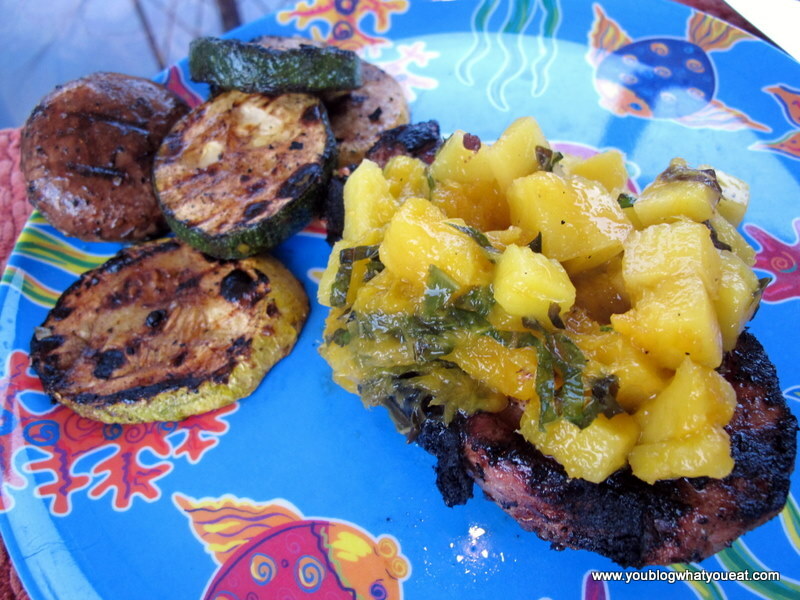 Mango pineapple salsa: fruit and fresh cilantro heated on the grill in an aluminum packet to top the meats. 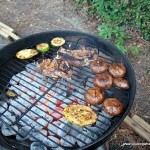 Throw each veggie packet in the coals, grill the meat, top with fruit salsa! 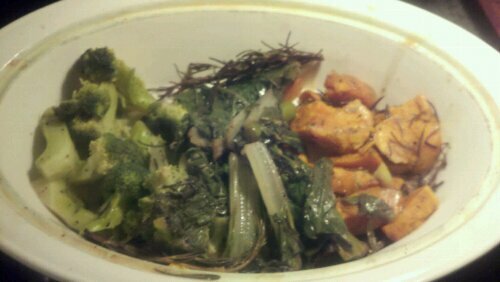 Roasted/Grilled veggie packets: sweet potato, greens, broccoli, garlic, rosemary..